I have a name and it has come to embody a meaning after so many years and so many experiences. I have never given much thought to its meaning but then again, I have never been forced to leave it behind. 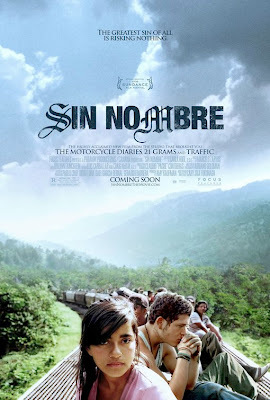 SIN NOMBRE translates roughly to not having a name and Cary Fukunaga’s debut feature film is an intricately detailed rallying of intersecting stories about people with no choice other than to leave their names and everything they mean behind them to start again. It is told by this promising newcomer with such respect and delicate ease that it breaks your heart at the same time as it opens it. El Casper (Edgar M. Flores) is a member of a Mexican gang called the Mara Salvatrucha in a town called Tapachula. He is no older than 20 but from the number of tattoos he sports, you know that he has been a part of this gang for some time now. He has taken an even younger boy under his wing as his protégé but there are signs that there may be bigger interests for Casper outside of the gang life; he has a girlfriend now and he is even willing to shirk gang responsibilities to be with her. The gang has no intentions of letting him walk away though. Sayra (Paulina Gaitan) is also no more than 20 years old. She has lived in Honduras her whole life while her father has been in New Jersey making a better life with a new family in hopes that one day he can bring over his daughter and give her the chances he never had. Before he could, he was deported and he now plans to cross over again but this time he will not be leaving Sayra behind. The trouble is, having not known her father and having never truly had the desire to leave Honduras, Sayra cannot figure why she is making the journey while she is making it. Casper and Sayra meet on a train. He saves her life and simultaneously condemns his own. After that, they are forever connected. Fukunaga, an American born filmmaker, spent two years researching SIN NOMBRE. He spent time with hopeful border crossers riding the tops of trains through an impoverished but beautiful Mexico; and he spent just as much time with gangs to understand their rituals and their reasoning. The care with which he crafted this beautiful picture gave birth to two fully fleshed out characters, rather than the clichéd shells they could have been, thus allowing their stories to come together and shape the journey. SIN NOMBRE is simply revelatory. Every turn is unexpected and every nuance makes each of these turns make perfect sense. The journey itself is never easy and the destination is never guaranteed but Fukunaga holds our hands with one of his while he asserts his immense talent with the other. Casper and Sayra may have to leave their names and their selves behind them to start their new lives but telling their story with such incredible promise makes Fukunaga’s name one that will surely be closely followed from here on in. How many sheep would you give Sin Nombre?